Gamification for Talent Development - Deconstructing the Psychology of Games to entice, engage, and encourage learners. 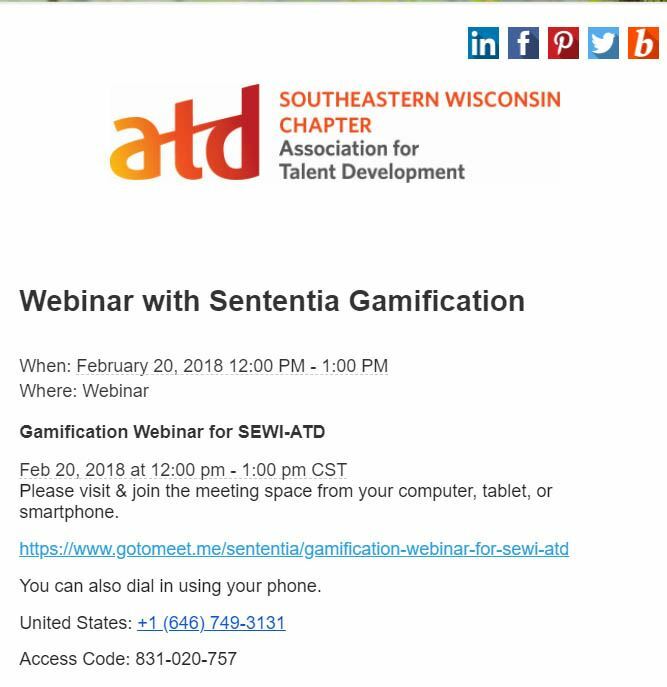 Join SEWI-ATD and Sententia Gamification for a 1 hour webinar on how you can bring gamification into your training and learning programs. This webinar will give you a glimpse into the Sententia Gamification Certification Level 1 Workshop SEWI-ATD will be hosting on April 20th at MRA, The Management Association in Waukesha, WI. Wouldn’t it be great to know how to introduce a gaming dimension into the corporate training programs you design or deliver? What would it look like to include game elements such as points, levels, challenges, rewards, and easter eggs to drive participation, engagement, retention, and to achieve a measurable ROI? Gamification of real-world training and development is a powerful technique which can motivate people and help generate loyalty to your organization, its products, and its message. At its core, Gamification is about finding the fun in the things that we have to do. When learning is fun, people remember, apply, and return to the learning. The Sententia Gamification Certification is the premier standard in the world for recognition as a gamification specialist for Talent Development Professionals. Holding a Certified Gamification Professional credential demonstrates achievement, competence, credibility and mastery to your employers, clients, colleagues, and professional peers. As an approved provider, Sententia establishes the benchmark for quality gamification training and assessments. By partnering with industry experts and gamification gurus, Sententia has developed a system for gamification accreditation for talent development professionals that is different from all other certification programs in the marketplace.